My eldest daughter absolutely loves banana walnut bread. It’s her favorite! She says this treat comforts her tummy and makes her feel good in her heart. I couldn’t agree more and I feel the exact same way when I enjoy a muffin (or two!). 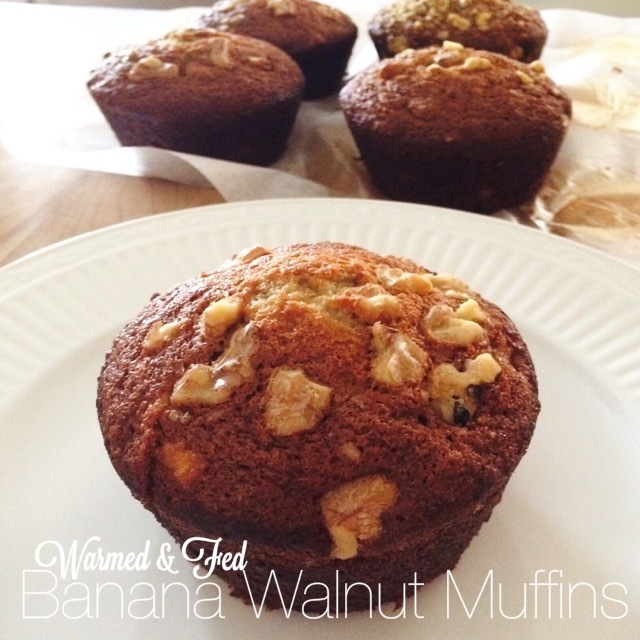 Recently, I have been making this banana walnut bread recipe into muffins for my family to enjoy. I find them to be the perfect size to fit in a lunch box as a special treat. Make a batch today! Preheat oven to 350º F. Lightly brush with butter and dust with flour a 9x5x3 inch pan. Sift the flour, baking soda, and salt into a medium bowl and set aside. Whisk the eggs and vanilla together in a liquid measuring cup with a spout and set aside. In a standing mixer, on high speed, cream the butter and sugar until light and fluffy. Lower the speed and gradually pour the egg mixture into the bowl. Mix until all ingredients have incorporated well. Gradually pour the flour mix into the bowl. Add the bananas. *The mixture will appear to be curdled. This is perfectly ok.
With a spatula, fold in the nuts and transfer the batter to the greased and floured pan. Bake for 30 minutes or until toothpick comes out clear. Cool in the pan for about 15 minutes. Place on a wire rack to continue to cool for another 5 minutes.